Good question! 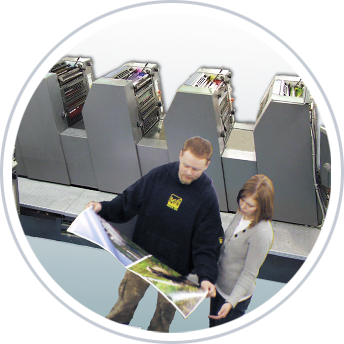 We are a full service commercial print shop and offer a wide range of products and services. To see a full listing and description of available products, check out our services tab. To obtain an estimate from us, you can either use our "Request an Estimate" form on our website, or you can call us at 563-1989 and one of our representatives can assist you. Can you provide some tips on how to save my design files? Providing us with a high resolution (at least 300 dpi) PDF is usually a good option when submitting your print-ready files to us. If you need us to work on your design file for you, then we would prefer having the native file (the Photoshop or Illustrator file, for example) including the layers so we can make any adjustments needed. Contact us if you're unsure about the format you should submit your file in. For good print quality, files and graphics should be saved to at least 300 dpi. Anything less than that can result in a grainy or blurry printed piece. A proof is a mockup of what your printed piece will look like. It is important to carefully review your proof for both spelling/grammatical errors and layout before approving it, as once you approve it, we are released from any liability to reprint due to spelling or graphics errors. Every screen will have a different resolution and will display colors differently. In addition, the colors on your screen are produced using the color model called RGB (Red, Green, Blue) to display images on your screen, which is a different process than the one used by printers to render images. Both of these combined together means that there is no way for us to reproduce the color you see on your screen when we create a printed product. Once you approve your proof, our typical turnaround time for digital and wide format jobs is 3-5 working days, and 7-10 working days for offset jobs. These are only standard time frames; individual print jobs may take more or less time than this depending on a variety of factors.